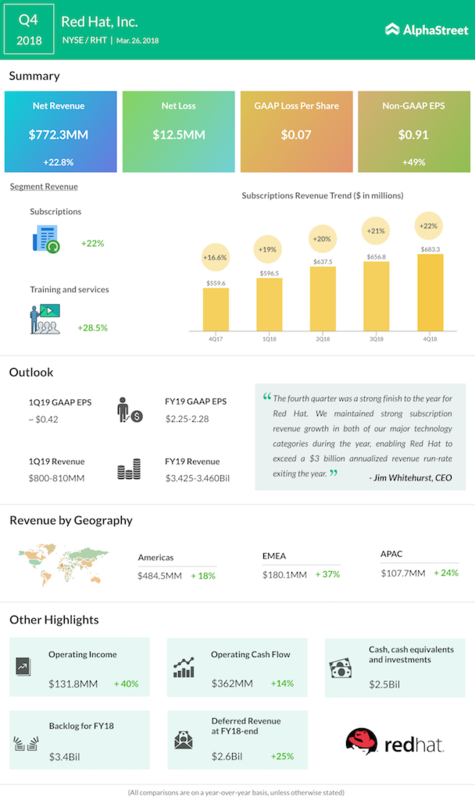 Red Hat reported solid growth in total revenues and subscription revenues for Q4 2018 and full year 2018. Quarterly results beat analyst expectations and sent the stock climbing upwards during the pre-market session today. The growth in total revenues for the quarter was driven by cloud products. The Linux distributor incurred a one-time charge related to the tax reform, which resulted in a loss for the fourth quarter. Excluding this charge, EPS was $0.91, ahead of market expectations. New products like Ansible and OpenShift fuelled Red Hat’s revenue growth as the company shifts more towards hybrid and other cloud-based products. Sales growth of application development products was almost triple that of infrastructure products. During the quarter, Red Hat acquired CoreOS, a container services provider, for $250 million. Red Hat believes there is growing opportunity in the container area and expects this deal to be a successful one in terms of strategic fit and payoff. Transformation in the digital sector has become a necessity and Red Hat believes that customers prefer companies that can give the infrastructure, scale, and flexibility to make this process as smooth as possible. Over the past weeks, several speculations have emerged over Red Hat being a potential acquisition target for Google. The theory is that Google could be interested in picking up Red Hat for its growing clout in the cloud business, and if Google makes a move, there is a chance that Amazon or Microsoft would come forth with their own proposals as well. However, if at all Google is looking at such a deal, it will not come at a small cost. The price will be very heavy because firstly, Red Hat is not a small player. It has a good industry position and market value. Secondly, the company is doing well right now in the cloud arena and it envisages further growth opportunities on the horizon as seen from its recent CoreOS acquisition. So, there is really no reason it would want to be acquired. Even then, if such a scenario were to arise, it would a very interesting one to watch.